Is a Dairy Free Diet Healthier? For years, there has been an ongoing debate around dairy products. More and more people are going on a dairy free diet due to popular diet programs, like Whole 30 and Paleo, promoting dairy elimination. The controversial Netflix documentary titled “What the Health” slammed the Dairy Industry, claiming milk consumption can lead to disease and negative health consequences. So, what’s the truth? Is a dairy free dietactually healthier? Let’s first look at how dairy became popular in the first place. Milk became more mainstream in the 1950’s, when it was mandated by the National School Lunch Program. 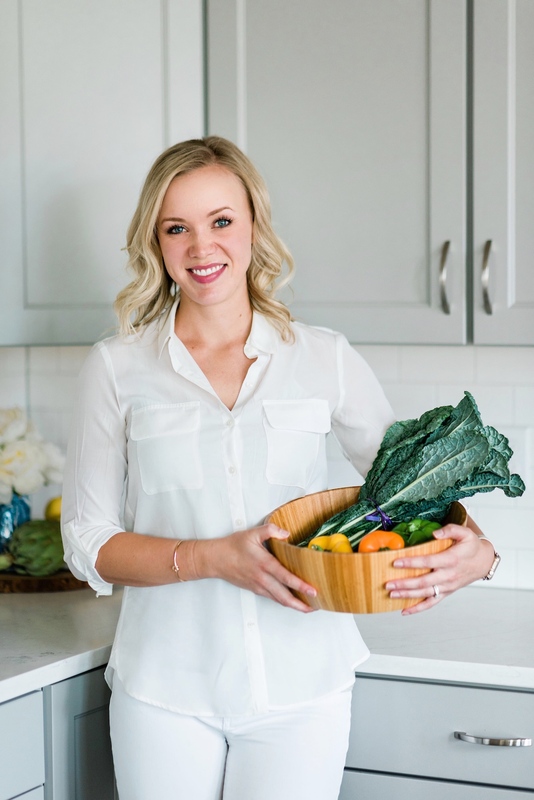 As a response to the famous (and controversial) saturated fat study by scientist Ancel Keys, the low-fat movement gained momentum in the 1970’s. By 1985, the United States Department of Agriculture (USDA) officially shifted to a pro-skim milk stance. In 1988, low-fat milk sales had exceeded whole-milk for the first time. America was further exposed to low-fat milk advertising in the early 2000’s with former First Lady Michelle Obama’s Let’s Move campaign. However, researchers began to doubt the studies used to promote skim milk. Whole milk begins to make a comeback. New larger studies began to show that people who drink whole milk are actually at a REDUCED risk for developing diseases like diabetes. Another similar study found that women who ate the most full-fat milk products actually had an 8 percent LOWER risk of being obese. The various research studies similar to these conclude that full-fat dairy can have a place in an overall healthy diet. In fact, full-fat dairy products are on the rise, including a nearly 20% increase in whole milk yogurt in 2016. The Dietary Guidelines for Americans began urging people to reduce fat (i.e. 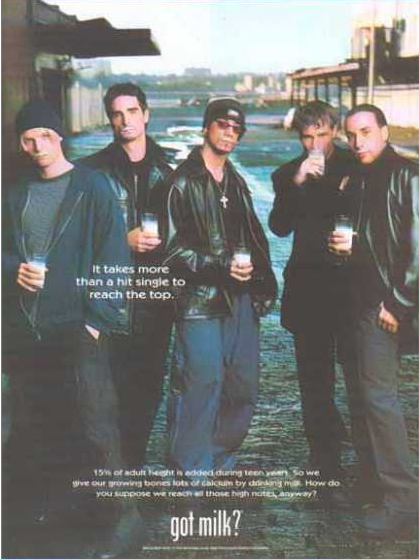 promoting skim milk) in their diet. The aim was for an overall reduction in saturated fat and cholesterol intake. However, while reducing fat, Americans consequently compensated by turning to excess carbohydrates as the answer. As we know, excessive intake of added sugars is linked to a greater risk for obesity, heart disease, diabetes, and more. Fat is back – but a dairy free diet is on the rise. Although the full-fat dairy industry is seeing a slight rise, there is no comparison to the increase in dairy free milk sales. The dairy free milk industry (such as soy, rice, or almond milk), has seen a continual 11% rise in sales each year, including nearly 1 billion in annual sales. Dairy free milk products, along with a dairy free diet, has some downfalls. Many of these products are very low in protein, with most almond milk products offering a measly 1 gram of protein per serving (versus 8 grams in conventional cow’s milk). Protein plays a large role in improving feelings of fullness, reducing sugar cravings, and providing the building blocks for muscles and tissues. Note, this is the ingredients label for the ORIGINAL flavor. Doesn’t that mean it’s supposed to be “plain”? Yet, the second ingredient is sugar! A lot of times, dairy-free milk products add extra sugar to provide a better tasting product. The benefits of these dairy free milks; however, is that they are lactose-free, and thus are suitable for those people with lactose intolerance. I have only been able to find two dairy free milk products so far that offer adequate protein/fat with no added sugar: MALK and NewBarn’s Unsweetened Almond Milk. For those people with food sensitivities or allergies to cow’s milk, these products would be a safer alternative. Related: Food Allergy vs. Food Sensitivity: What’s the Difference? What is good about conventional dairy? Dairy gets a thumbs up in the protein and fat section. In comparison with other dairy free milk alternatives, traditional milk has more protein and fat. This means that it will make you feel more full, for longer. Conventional dairy products are a great addition to morning smoothies, because of the protein and fat content! Probiotics are beneficial gut bugs that can improve our immune system and rebalance our overall gut health. The most popular consumed probiotic is conventional yogurt. Kefir, a fermented dairy drink, also offers favorable amounts of probiotics. Conventional dairy offers an excellent growing medium for these favorable bacteria. Granted, there are also ways to consume these excellent gut restoring probiotics through dairy free milk sources such as kombucha and kimchi. Babies and toddlers should get about half of their calories from fat, which is why the American Academy of Pediatrics recommends providing conventional whole milk from 12 months up to 2 years of age. The protein and vitamins in conventional milk also make it an excellent source of nutrition for young children. In those children with a suspected cow’s milk allergy, your pediatrician may recommend a milk trial – a controlled introduction of milk to the diet. This should always be carried out under the supervision of a doctor. Some children may be lactose intolerant – which in this case a lactose-free whole milk would suffice. A child over the age of 1 year with a milk allergy may need a dairy free milk substitute such as soy milk. Talk to your pediatrician if you suspect a milk allergy or intolerance in your child. The good news is that most children will eventually outgrow the milk allergy by ages two to five years. What are the drawbacks of conventional dairy? Functional dietitians often refer to milk as a “Russian roulette”. There are many antigens (substances that can cause an immune response) in cow’s milk. The location and diet of the cow throughout its life can affect the antigen content of its milk. For example, a conventional corn-fed cow’s milk would differ from the content of a 100% grass-fed cow’s milk. So, there are many opportunities for a negative immune response to these corn related antigens. People with autoimmune disease such as Multiple Sclerosis, Rheumatoid Arthritis, Inflammatory Bowel Disease and more may find some relief on a diary free diet. Some studies show a striking correlation between a populations’ milk intake, and the prevalence of autoimmune diseases, like Multiple Sclerosis. Epidemiological studies cannot prove a cause. However, dairy is often one of the first food components to be eliminated on the LEAP/MRT Food Sensitivity Program because of the association with autoimmunity. This is not an end all, however. Some patients find that they can successfully reintroduce certain conventional dairy products, without any worsening of symptoms. A dairy free diet is also common in people suffering from certain skin conditions. Increased dairy intake may worsen acne in some people. While the restriction of dairy for acne remains controversial among health providers, trialling a dairy free diet under the guidance of a registered dietitian may provide insight as to your individual reaction. Related: Are Food Sensitivities Causing Your Symptoms? Conventional dairy products contain lactose, a milk sugar that requires the enzyme lactase to be digested in the human body. An estimated 65% of the human population is unable to digest lactose properly. Lactose intolerance can cause not-so-nice symptoms like gas, bloating, and diarrhea. So, it makes sense that many people feel better on a dairy free diet, like Whole 30, which eliminates this food product that disagrees with more than half of the population. The grass-fed food sector continues to grow exponentially at a rate of 30% each year. But, what does grass-fed mean exactly? Well, the most basic explanation is the most obvious: grass-fed cows rely 100% on grazing the pastures and eating grass for their sole source of nutrition (no soy, corn or grains). In the winter, grass-fed farms may supplement the cows with hay (dried grass) on the pasture. Grass-fed cows produce higher quality, nutritious milk. Higher amounts of beta-carotene, a precursor to Vitamin A, is found in grass-fed dairy products. This milk also contains more antioxidants, like Vitamin E and glutathione, which protect against chronic disease such as heart disease and cancer. And if that isn’t enough, grass-fed cows also produce higher levels of the anti-inflammatory omega-3 fat. The standard American diet does not include nearly enough omega-3 fatty acids, so making the change to grass-fed dairy products can help you achieve an overall healthier fat ratio. Unfortuantely, most grass-fed dairy products come with a higher price tag. It is important to note that an organic dairy label does not necessarily guarantee that the cow was only provided a grass-fed diet. 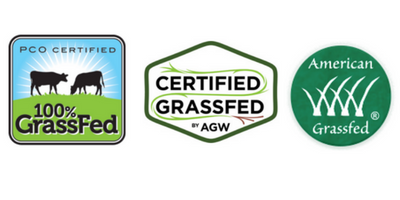 However, some 100% grass-fed farms are indeed certified organic. Additionally, the government does not regulate the term “pasture-raised”, so this also does not guarantee a 100% grass-fed diet. Choose dairy products that have fewer ingredients and added sugars (this includes artificial sugars!). Don’t fear the fat. As always, it is best to find a plain dairy product (i.e. yogurt) that is 2% or full-fat in order to increase satiety, and curb those sugar cravings. Sweeten it yourself with berries, or spice it up with a dash of cinnamon. Afraid that the extra calories may cause unwanted weight gain? Remember, new research actually shows that you have a REDUCED risk of obesity when consuming whole milk products. What has your experience been trying a dairy free diet? Leave a comment below! Psst! If you’re feeling overwhelmed about all of the decisions for a dairy or non-dairy product, don’t fret! I’ve done all of the research for you. 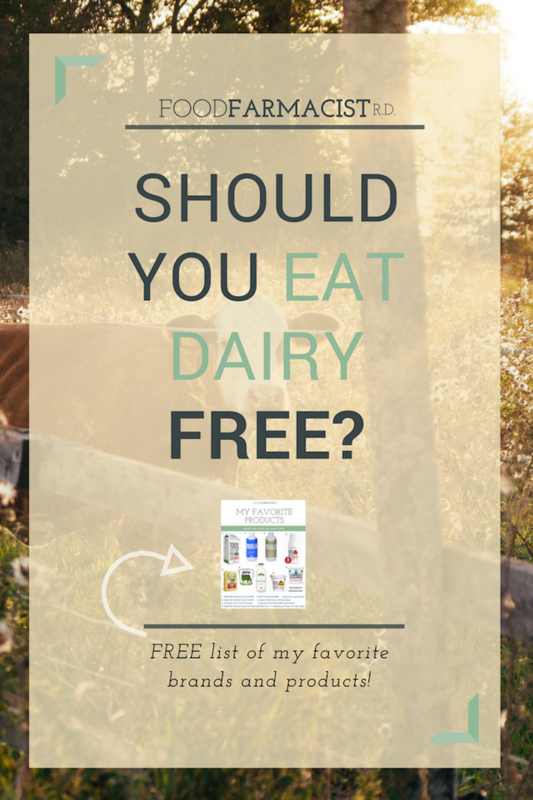 Download my list of favorite products (both dairy and non-dairy) today. 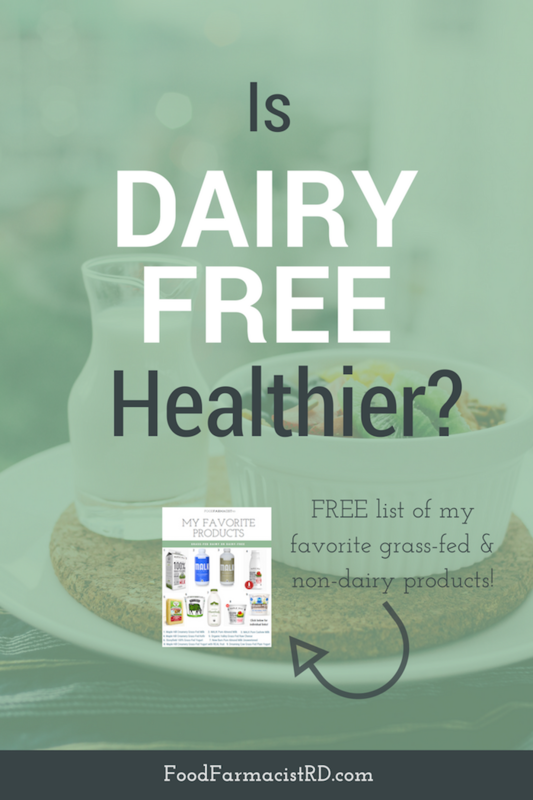 Curious as to my favorite dairy and dairy-free products? Download this list to find out!